Early Mortgage Payoff Calculator – Be Debt Free! How soon can you pay off your home loan by making additional principal payments? How much can you save in interest by increasing your home loan payment? This Early Mortgage Payoff Calculator helps you find out. Click the "View Report" button to see a complete amortization payment schedule and how much you can save on your home loan. Determine your accelerated payment, and how much sooner you will pay off your home loan. You may be surprised with how a little extra payment makes a big difference. 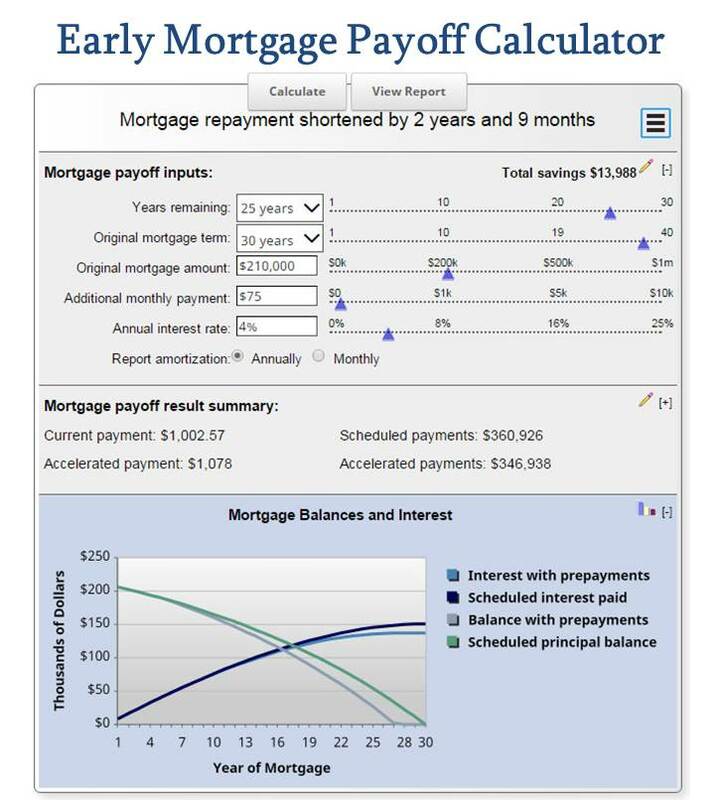 Email the Early Mortgage Payoff Calculator results by clicking on the 3 lines in the upper right hand corner of the calculator. Click on "View Report" to see the loan amortization schedule as well as the mortgage amortization schedule with extra payments. You may pay off your home loan even faster if you refinance - using a refinance calculator with current mortgage rates may help you see if that makes sense with your payoff mortgage early goal.